The Chinsegut Conservation Center Tract is a part of the Chinsegut Wildlife and Environmental Area, and derives its name from the conservation and nature center located on the property. It covers 408 acres, and is managed by the Florida Fish and Wildlife Conservation Commission. The Center is open to the public for limited times during the week (see links below to check schedule) - but the Chinsegut Wildlife and Conservation Area is always open for hiking and wildlife viewing during daylight hours. The Center hosts wildlife education programs and guided hikes throughout the year for groups and school field trips. Outdoor skills programs are also offered at certain times of the year. The main entrance to the property is on the south side of Lake Lindsey Road, west of U.S. 41 north of Brooksville. The Conservation Center building is at that location. You will also find a chimney swift house, a stage for outdoor programs, picnic tables, and restrooms. Just south of the parking area, you can see the remains of an old homestead dating from the 1800's that belonged to the pioneering Bishop family. Hiking trails are well marked and maintained, and mostly shaded. Bicycles and dogs are not permitted on the trails. The trail running along the north tip of May's Prairie includes a boardwalk and observation pier, as well as a spur for viewing a large sinkhole. 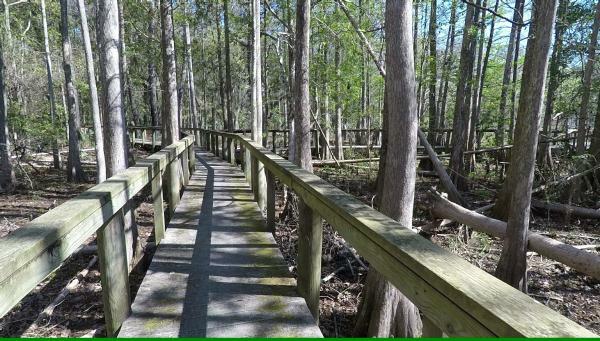 The Prairie-to-Pines trail connects the Nature Center to the Big Pine Tract of Chinsegut WEA - for those who want to do a grand tour on foot. The Praire-to-Pines trailhead is located at the south tip of the tract at the intersection of U.S. 41 and Hernando County highway 581.